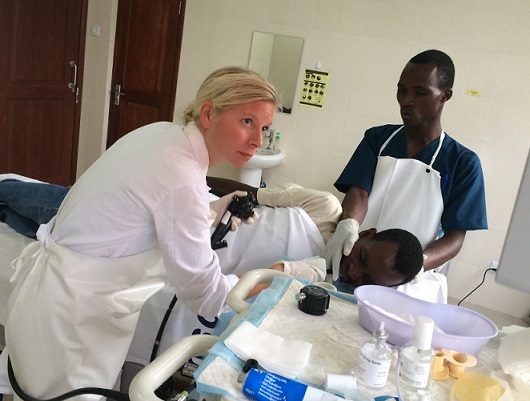 Dr. Burman treating a patient in Tanzania, Africa. Blaire Burman, MD, always had a feeling she’d become a doctor, but it was living in South Africa that sealed the deal. In 2001, funerals from AIDS deaths were weekly occurrences, compelling Dr. Burman to volunteer with children made orphans by the disease. She sought her education in the U.S., double majoring in pre-med and African studies, resolved to someday return to the region. After completing her internal medicine residency and fellowship in gastroenterology and hepatology, fate intervened to send Dr. Burman to the East African country of Tanzania. A surgeon she knew was connected to a hospital in the port city of Dar es Salaam, where a group of Tanzanian physicians had obtained a working endoscope. The lack of equipment like endoscopes is a big reason digestive disease experts can rarely successfully volunteer in developing countries. With the ability to scope and perform procedures on the esophagus, Dr. Burman saw possibilities for diagnosis and treatment. What didn’t seem possible was the age of the patients. Advanced liver disease, including cirrhosis and liver cancer, was showing up in children. The main culprits were untreated viral hepatitis, long-term parasitic infections and conditions related to AIDS. A diagnosis would typically go untreated, but gastrointestinal bleeding, a lethal complication of disease, is where endoscopy could make a life-saving difference. Dr. Burman split her days between teaching and performing endoscopy and rounding, seeing patients in a part of the hospital dedicated to advanced gastrointestinal disease. Hospital conditions were dire. Unless families bring food, there is none; patients must pay for everything out of pocket, including fluids, equipment and medicines. If a patient can’t afford the banding kit to treat internal bleeding, they will die. Far from being overwhelmed by the suffering and loss, Dr. Burman sees a critical role for herself and physicians like her to extend life and offer comfort to a growing group of patients in East Africa. For reasons not fully understood, esophageal cancer is epidemic in the region. With no treatment, the esophagus closes up, causing a horrific death. The insertion of an esophageal stent maintains the opening, so patients may continue to eat and drink. Dr. Burman notes that the few esophageal stents the hospital can order come from India, at a cost of about $200 apiece. In the U.S., they cost closer to $2,000. On the other hand, drugs to treat hepatitis B, a leading cause of gastrointestinal cancer in Africa, are relatively cheap. But only patients receiving government-funded drug treatment for HIV get the bonus of being cured of hepatitis B, which succumbs to the same drugs. Blaire Burman, MD, is director of Virginia Mason’s new comprehensive Hepatitis C Clinic focused on multidisciplinary care, promoting liver health and achieving a cure. The Hepatitis C Clinic team within the Liver Center of Excellence provides comprehensive diagnosis, evaluation and treatment for patients with all stages of chronic hepatitis C. For more information, please call (206) 223-2319. Inspiring story. Having traveled in Africa I know how we hit the jackpot or not, just beacuse of where we’re born.